The inspiration for this project was to place some restraints on composition 4 tracks, 4 instruments from a related musical family, 4 minutes long. I wanted to encourage music with perhaps a stronger emphasis on melody and harmony than on the textural approach of some CT projects. Each part recorded onto one track of my Boss microBR recorder using the inbuilt microphone. 4 parts downloaded into 'Reaper' DAW, where editing was carried out, including correction of some timing mistakes, and creatively changing the timing of certain parts. Some simple effects were applied across the master buss (noise reduction, touch of EQ to remove some midrange, a hint of reverb and the meerest sniff of compression). I found this project really liberating, it was actually great having to be restricted to 4 parts, and not having to succumb to the usual temptations of adding 'just a little bit more tambourine in section b of the chorus' syndrome. Thanks Michael, you're very kind. Sweet pretty tune :-) The sound is very good for a live recording with buil-in mics. I wasn't expected the MicroBR could do this. Very, very nice track ! assigned to flute, oboe, clarinet and bassoon, a wind quartet manifested mellotronically using a double harmonic Byzantine/Charhargah mode that is also believed to have been used in ancient Icelandic music. dco - guitars (electric, semi-acoustic and electrocoustic) variously strummed, plucked, picked, e-bowed and Jellyfished). Constructed in Acid Pro 6; edited and recombinated in AudioStudio 8. The piece was inspired by last year's 125th anniversary celebrations of the august academic organisation which permits me gainful employment in one of it's libraries. And a finale in 9/8 based once more on the upward spiral of CDG DEA GAD speeded-up with a touch of time compression to achieve the 4 minute time frame. wonderful !! how did you do that? Thanks Michael. It's four different sets of grand piano samples played by midi keyboard and quantised (I'm no pianist). 1st half is composed, 2nd half improvised. I always greatly enjoyed your inspirative and inventiv works, those I heard long before and the two that are available on Internet. "Funny" tune. Sounds like the perfect follow-up of the "Anti-Accord Absolu" played by Antoine in Les Tontons Flingueurs. A little more info about this track. Bass and 3 guitars. Guitars were tracked through a VG88 into several delays. Bass is DI through a TubeMP into a DL4 & DD20. All recorded into Sonar. I started the project with very written out structured parts, but as I got into recording, I liked the little motif and played it off of the delayed parts. I like very much; kind of aerial cristal tune. Though some false notes and unwanted noises (in my opinion) should have been removed, and the bass less trebly sounding. A quartet for four sets of high bells. It is based on the pitch class [0,1,3] and its inversion [0,2,3]. Though the piece starts in the middle of a strict canon, it quickly breaks down in terms of complexity and tempo. 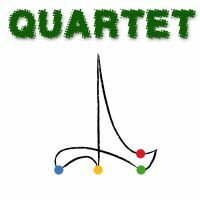 it's a kind of jazz quartet with guitar (nylon acoustic), piano, drums & double bass. of course all of them virtual instruments. another frankenstein baby totally improvised, with each part played without listening to the other backing tracks and then pasted on top, with tiny edits (ending). for the input i used a 25 keys midi keyboard as sole instrument. first takes only! ..